Sarasvati, the river goddess and the Goddess of Wisdom, is known as Benzai-ten in Japanese language and is one of the seven most important Gods-Goddesses of Japan who provide luck. originally a mighty river in ancient India (mentioned in the Rig Veda). Later she became the eponymous deity of that river. However, she was associated with wisdom, knowledge, music and good fortune. 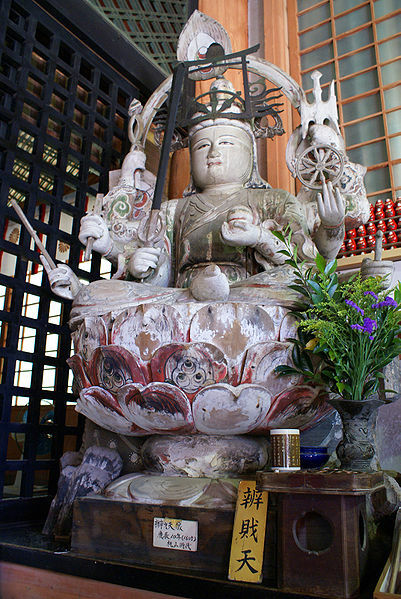 Benzaiten arrived in Japan between the sixth and eighth centuries with Buddhism, primarily through the Chinese translations of the Sutra of Golden Light (金光明經), which has a section devoted to her. 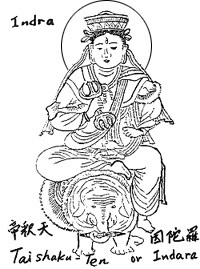 She is also mentioned in the Lotus Sutra. 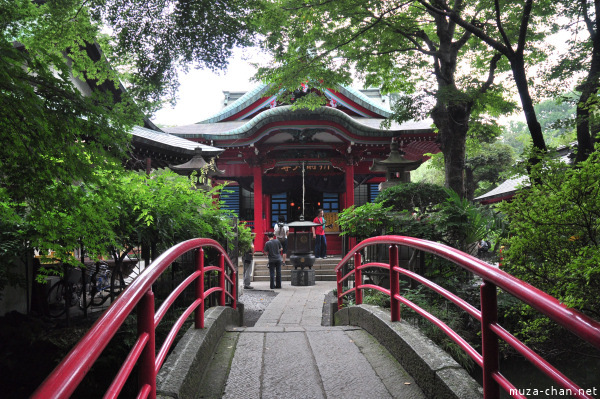 She was later incorporated into Shinto religion as one of Japan’s Seven Lucky Gods. and also longevity and wealth. Japanese consider her to be the inventor of Sanskrit language, the divine language. The characters used to write her name in the early Chinese-Japanese script, read ‘Biancaitian’ in Chinese and ‘Benzaiten’ in Japanese (辯才天), reflected her role as the goddess of eloquence or speech. The Sutra of Golden Light promised protection of the state, hence in Japan she became a protector-deity, at first of the state and then of people. It is possible that Sarasvati became fused with Durga of India at this very period. dragon are the central figures of the Enoshima Engi (江嶋縁起), a history of the shrines on Enoshima written by the Japanese Buddhist monk Kokei (皇慶) in 1047 A.D.
(Suzuki, Teitaro, The Seven Gods of Bliss, The Open Court, XXI, 1907, Chicago; http://www.sacred-texts.com/journals/oc/ts-sgb.htm ). 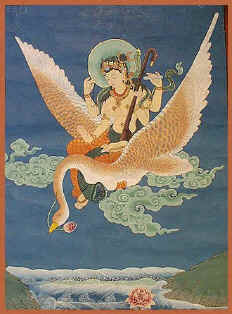 BRAHMA-Cosmic Flow-and PARA-BRAHMA- Constitutes Two facets of NATURE-Merges with DIVINE MOTHER NATURE- MAYA. MAYA constitutes -Reflector to SRISTI-STITHI-LAYA- Called TRINITY-here TRINETRAM. SARASWATI integrates with stability-Sree LAKSHMI-Prosperity and Stability-Sree RAJA RAJESWARI- Dance-Music-LAYA- Link to SIVA.. Very useful to get this picture of interconnectedness while people engage in interfaith dialogs. Thanks to the Dalai lama a tremendous scholarly underpinning of Buddhism is taking place in the modern times. All over the world people are getting educated on the depths of Buddhist religious philosophy. But the same can nt be said of Hinduism of which Buddhism is but a shoot. Hindu scholarship in the modern times stands no comparison with Buddhist scholarship and propagation. A great amount of research has gone in to this article of Dr. Premendra. Hindu activist intellectuals must be beholden. great work. What would be interesting is the unity of both hinduism and buddism over the centuries. We know of universities, temples, and many people believed in a mix of beleifs, blending one from the other. The Eurocentric version based on a few arabic sources, depict a religous war between the two, of which no history exists. I have read many sutras, many gurues, many spiritual masters of both hinduism and buddist adapting and borrowing aspects from each other. India has no religous genocide where one faith has waged a war on another, many kings of what ever faith would patron many temples of all faiths. It would be good to know the unity of sanatna dharma and buddism,Btw great article, just goes to show the diversity of india culture which has been part of at least 3000years of civilisation. It goes to show also the massive destruction by european christians over the past 200years. Great work. I do not consider Buddhism and Veda/Vedanta to be separate. They may not be identical, but they are not two either. Rather, they are a wonderful, single system of thought.